This gloomy weather will not be bringing me down! I've got so many fun things happening this week that I'll make my OWN sunshine. We head to Minneapolis on Friday for our Stampin' Up! OnStage event. This is the bi-annual training event where we are inspired and get to see fun new product and the likes. LIKE THE NEW Catalog that will be coming out shortly. Doooh….how cool is that. I've got a guy coming to measure my kitchen counter tops and one of my favorite cousin is going to hitch a ride along with him. We are going to have fun while the poor guys works! And if I have a date for counter top measurements…that means……my carpenters are installing the cabinets as we speak. Oh man, it's so stinkin' exciting that I can't even stand it! I'm easing back into a full Stampin' schedule now that we are getting a little closer to having a kitchen back. Check out the class schedules and make note that we will be having a booth at the upcoming Scrapbook Expo. Make sure you stop in and reserve YOUR copy of that FREE 2017-2018 Idea Book and Catalog. And speaking of classes. 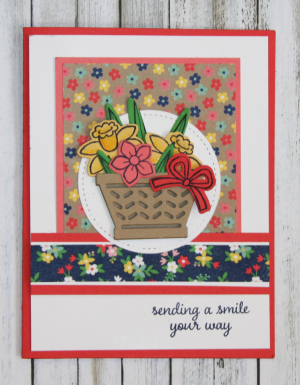 Here's one of my favorite cards for my upcoming Spring Fever class on Monday, April 10th – two sessions 9:30am & 6:30pm (earlier pm start time is an option). Register Here! 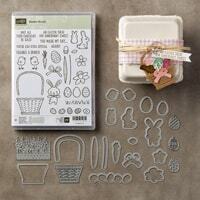 This set is the Basket Bunches set and is one of my current favorites. It's so much more versatile than when you first take a peek at it. It's not just a one dimensional Easter set. Check it out!